Minneapolis is an iconic American city nestled on the banks of the Mississippi River in southeastern Minnesota. With a population of nearly half a million people, it is the largest city in the state of Minneapolis. In the 19th century the city thrived on mills for numerous industries and at one time it was dubbed the "world’s milling capital" for its great and thriving milling industry. You will still find great mills for some of the top Fortune 500 companies such as Pillsbury and General Mills operating there. Minneapolis is great city that is welcoming to visitors from all walks of life. You should consider Minneapolis on your next vacation as it has great attraction sites that are also affordable to visit. Below are some great places in Minneapolis that you should consider visiting while in the city. Some of the terminals at MSP airport can be quite long such as the Lindbergh terminal so getting to the airport on time can be very important. This is why hiring a driver from our shuttle providers can help you get to your flight on time as the driver is set to a schedule that understands the traffic and the correct terminals and locations you need to be at. With this well known Blue Van service travelers can be taken to hotels such as the Loews Minneapolis Hotel as well as luxury accommodations at Le Méridien Chambers Minneapolis. With this black car service you can get MSP airport transfers for executives or travelers wanting a little more style to their ride. The Minneapolis-Saint Paul Airport is a modern era airport, made with state of the art techniques and designs. It can be easily termed as one of the finest airports in whole of the US. It is used both for civil as well as for military purposes, therefore, it is huge in importance. We are terming it as one of the finest airports because of its unique design and building structure. It doesn’t have many smaller terminals like other airports in the country. Instead, it has a single, larger terminal which hosts all the passengers. This makes navigation a lot easier and your chances of missing your flight reduces drastically. The staff at the airport is well-trained and knows how to serve the people. As a result, you don’t get to wait for long in the lines, nor you have to undergo severe checking drills at the security check. Moreover, the place has some of the amazing cafes serving delicious food. The vast space inside the airport allows you to sit and relax in case your flight is on delay. Furthermore, the airport is directly connected to Minneapolis railway service which takes you to the central city downtown within a matter of minutes. This furthers the passenger’s ease as you can hop on the metro and reach here from anywhere in the city. Lastly, the airport’s runways are designed in such a fashion that you get scenic views of the beautiful Minnesota River and Minnesota National Wildlife Refuge while you’re on the flight. The Minneapolis-St. Paul International Airport is internationally recognized as one of the best facilities in the country, but even the best have bad days. If you’re arriving with a large flight, among other crowds, you’ll probably be exhausted once you’ve fought your way through baggage claim, making it that much more vital to book a shared ride van from SuperShuttle. When you schedule your ride, ask if there is any existing deals that could make the affordable ride even cheaper. Vans can be lifesavers for groups too big for SUVs and too small for buses. By booking a state-of-the-art vehicle, courtesy of downtown shuttle providers, you’ll be riding in the safest and most efficient ride modern van engineering has to offer. Visit the iconic Guthrie Theater, a beautiful venue that’s been host to a plethora of famous acts on three different stages. When you’re done with the show, take everyone out to the gourmet comfort food restaurant, 112 Eatery, a tasty joint that is the most-reviewed kitchen in town. The greatest joy that comes out of driving your own vehicle is the special stillness that comes with it. Check out the stiller parts of Minneapolis by riding around town in a private sedan, enjoying the innovative exhibits that transform the would-be-boring topic of flour into a fascinating evolution of production. Reserve a ride by booking with us, hopping into a sedan and visiting the romantic waterfall at Minnehaha Park, one of the most exotic-feeling city parks in the world. Minneapolis is a city known for its fusion of the natural and urban, an art form very few places can successfully pull off. Because of this, the city has become a breeding ground for parks and lakes. The Minneapolis Sculpture Garden is 11 acres of landscaped art constructed on the outskirts of downtown. Go for a walk through the contemporary pieces by scheduling a private SUV pick-up from shuttle transfer companies. Private SUVs are especially helpful for families on the go, whether you’re fishing at the Lake of the Isles or enjoying the lush gardens at the equally tranquil Lake Harriet. Just because Minneapolis is known for having a vast economy of mom & pop shops as well as a variety of family-owned restaurants doesn’t mean there isn’t a swankier part of town. With hundreds of bars to check out, it’s hard to pick out the best, but in Minneapolis there’s no contest. Schedule a ride from luxury giant and visit the historic Irish pub, The Local for outdoor patio seating and a warm environment that not only elevate it from the rest, but separate it as well. The American Swedish Institute is a historic Swedish museum and arts center that celebrates the state’s rich history of Swedish immigration. If you’ve got several people in your party, book a chartered bus from us and visit other amazing museums like the Weisman Art Museum, which has a classic, yet contemporary design that houses thousands of paintings and ceramic artifacts. Minneapolis was once home to the largest flour mill in the world. It is situated in the waterfront district just in the vicinity of the Mississippi River. 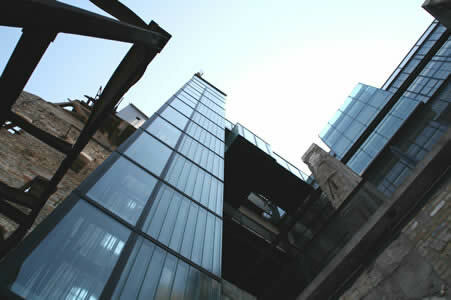 Visitor to this great city will find visiting the Mill City Museum very fun and interesting too. If you are planning a trip to visit Minneapolis you’ll want to spare some of your time to go and tour the largest flour mill of the world. → There are tons of things to see and do here. The museum features an exhibit gallery, which you can explore at your own pace. One of the exhibits even features an elevator ride that lasts for eight stories. → Want to know more about the history of Minneapolis? Watch the museum’s film “Minneapolis in 19 Minutes Flat” to get you up to speed. → The observation deck located on the ninth floor features breathtaking views of the city as well as the Mississippi River and St. Anthony’s Falls. 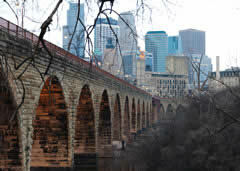 The Stone Arch Bridge is also another of this city’s great landmarks. Countless people whose travels bring them to Minneapolis have photographed it as it is quite a picturesque spot. This famous bridge on the Mississippi River was built a very long time ago back in 1882 but it still remains a marvel today. → Currently the bridge is only used by bikers and pedestrians so you can take advantage and cross it if you are out for a run, walk or bicycle ride. → As you cross the bridge you will be able to spot the St. Anthony Falls and the Mississippi River as well as the downtown Minneapolis area. 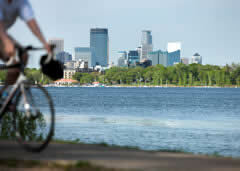 Minneapolis is also home to some of the largest urban bike trails in America. Cycling enthusiasts in the city usually take their time to enjoy doing what they love best in this oasis for bicyclists. → The good thing about Minneapolis’ trails is that the city has a generally flat landscape making it safe and easy for most cyclists who wish to cycle here. → You don’t have to worry even if you don’t have a bike of your own as you can rent one at an affordable cost through the city’s Nice Rides program. This is a unique venue for musical events as well as theater productions and countless other types of events. The building used to be the federal courthouse and post offices. It has now been turned into a music haven for upcoming music artists situated in downtown Minneapolis. → The Landmark building plays host to the music events, weddings and more but originally the building was a courthouse. → This place is usually lively. There are numerous concerts performed there weekly and most are reasonably priced so be sure to stop by on your next trip to the Twin Cities.